A TV celebrity chef will be joining three of north-east’s top chefs to cook up a unique gourmet evening which is set to thrill Aberdeen. Tony Singh MBE, who was awarded an MBE in the New Year’s Honours list in January, is the fourth prestigious chef to add his name to the Savour event, which has been devised to excite the sense of sight, taste and smell. 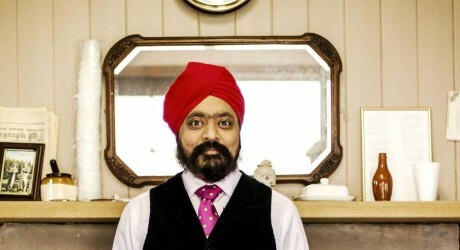 Mr Singh was recently awarded an MBE for his services to the food and drink industry, and also for his charity work. The Saturday Kitchen, Great British Menu, Celebrity Eggheads and Pointless star, Mr Singh owns Tasty restaurant in Glasgow as well as a Tony Singh at the Apex, in Edinburgh’s Grassmarket. He will join Nick Nairn and chefs, Paul Whitecross from Trump International, and Ross Spence, from the Marcliffe Hotel & Spa, to cook up Savour, an unique event, which will see the four chefs working together for the first time ever. The culinary feast will take place on Saturday, 4th March, at the Marcliffe Hotel & Spa. The event is being hosted by North East Sensory Services (NESS), a charity which supports over 6,000 people who have severe hearing or sight loss. The chefs will each create a course for the gastronomic adventure, focusing on the senses of taste, smell and sight, which coincides with the charity’s work with people with sensory loss. As well as a four-course dinner focusing on the senses of taste, smell, and sight, the evening will include a champagne drinks reception, a VIP auction and raffle, followed by entertainment and dancing. Savour will take place on Saturday, 4th March, 2017, at the Marcliffe Hotel & Spa. Tables are priced at £950, with individual tickets available at £95, and can be purchased from http://bit.ly/2hUje7e or neil.skene@nesensoryservices.org or by calling 0345 271 2345. MEDIA RELEASE issued by Frasermedia. You too can share your stories (aka press or media releases), on allmediascotland.com. Email here for more information. Check out too twitter.com/allFoodPR, twitter.com/allAberdeenPR and twitter.com/allCharitiesPR.